The Lawrence Corporation for the advancement of the Visual Arts (The Lawrence Percolator) is a 501c3 community art space in Lawrence, Kansas. Use the button below to donate to the percolator's operational budget! Q – What and where is the Percolator? 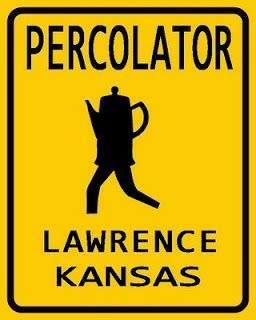 A - The Percolator is the project space of the Lawrence Corporation for the Advancement of Visual Arts (LCAVA) a 501(c)3 non-profit organization dedicated to bringing new art and cultural events to audiences in Lawrence and Douglas County, KS. The Percolator is located in the alley behind 913 Rhode Island just south of the Social Service League. Q - When is the Percolator open and what is your email, website, and mailing address? A - We are open on Saturdays and Sundays from 12 – 5, and on the Final Friday of each month from 5 – 8. Q - Didn’t LCAVA used to put on the Lawrence Own Your Own show? How did LCAVA turn into the Percolator? A - Yes, LCAVA did run the LOYO show, but decided to end the annual show in 2007. In early 2008, the board of LCAVA asked members of the Percolator if we would be interested in assuming their board and taking over the direction of their 501(c)3 non-profit. On March 6th, 2008 a group of eight Percolators were voted in as LCAVA’s new board of directors. Q - What kinds of things does the Percolator do? A - Lots of different kinds of things from a meatloaf competition to an exhibition devoted solely to clouds to writing workshops to small concerts to lectures to who knows what. Look at our website lcava.org to see what we have done in the past. Q - Where is the coffee? A - We occasionally have coffee, but our use of the word Percolator is a metaphor. Q - Why is it called the Percolator? A - Christina Hoxie suggested this name because it brings to mind an intense environment of lively activity or excitement. It conjures images of bubbling energy, of springboards catapulting new ideas, of a sweet beehive of innovation. Not unlike the “alternative” art spaces of the 1970s, percolators have been popping up all over the U.S. We are linked to this movement. Q - How did the Percolator get started? A - The original idea, formed in 2007 by a group of artists, architects, writers and others, was to create a more supportive environment for the arts after a string of gallery closings and a slow draining away of artists to regions with more opportunities. There was a recognition that within a formal school environment, artists enjoy an infrastructure of mentors, classes, fellow students, work space and funding. Beyond this familiar cocoon, working artists must find new spaces and supportive communities enabling them to evolve in their practice. The original concept for the Percolator was to fill a niche for working artists in Lawrence while creating a new place for the public to learn about and experience the arts. Importantly, this would be a place where artists and audiences could interact comfortably. Far away from the established urban centers of art and culture, there is a desire for something more active and fulfilling, beyond the typical cultural entertainment fare. The Percolator is our response to this need, in our corner of the world. Q - Who were the original Percolators? Q - Who runs the Percolator / LCAVA? Q - When did the Percolator begin using its current space? A - In early 2008, the owner of the house at 913 Rhode Island and the building behind it (the Percolator) offered the use of the space. He was interested in supporting a grassroots arts organization and offered the space for nominal rent, utilities, and contingent on LCAVA carrying liability insurance. LCAVA now has an annual lease for the building. We pay for utilities and carry liability insurance. We are grateful to this patron for their generous gift. Q - How is the Percolator funded? A - The Percolator operates on a very small budget. So far, we have no paid staff. We raise funds from individual donations, 20% commission on sales of art, art and music benefits, and grant writing. Q - Is the Percolator a collective, gallery, or what? A - In a way, all three. The Percolator board works together in a collective fashion to develop new exhibitions and to partner with outside artists and organizations. It is also a gallery in the sense that the Percolator exhibits the work of artists in individual and group shows who are not Percolators. The Percolator is also a what? in that we are a flexible, creative, evolving group open to new ideas. Q - How can I show my work at the Percolator? A - Complete a proposal form and/or submit your work to one of our exhibitions that has an open call. Check our website lcava.org for details. Q - How can I get more involved with the Percolator? Do you need volunteers? A - You are welcome to attend one of our monthly board meetings if you have an idea you want to share. Just give us a heads-up so we can put you on our agenda. If you are interested in more responsibility, let us know and we’ll consider you for the board of directors. We use volunteers on a show by show, event by event basis. Leave us your contact information and what you might be interested in doing and we’ll contact you when we need your help. Q - Can other groups/individuals use the Percolator space? A - Yes in some cases, but you need to submit a proposal form at least one month ahead of time so the board can review your request. Q - Where can I find a listing of upcoming events? Q - How can I make a donation to the Percolator? Lawrence Percolator. Travel theme. Powered by Blogger.